Your friendly west side chess club with a lot of history. Time: Tuesdays from 7 p.m. to 11 p.m. 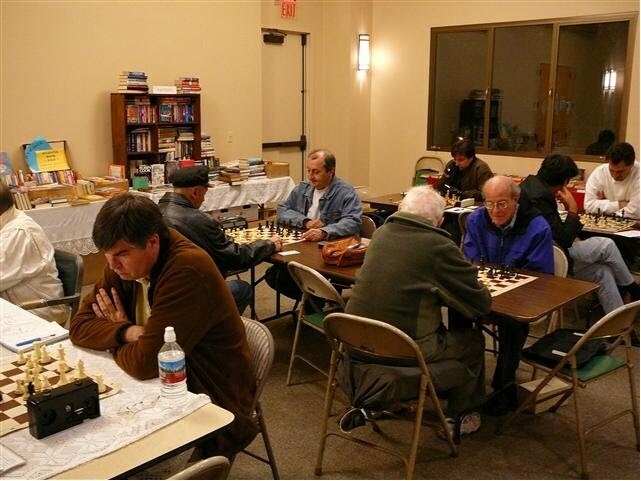 The club runs continuous tournaments rated by United States Chess Federation. Time control G/1:55 (d5). 4 round Swiss and 3 round quads. Rated tournament and casual play. Spectators are welcome. Club Membership: $75 per year. Tournament entry fees are $10. $25 to non-members. Directions: Corner of Federal Ave and National Blvd. (A block east of Barrington Ave.) The events held in the church library. The church is on the north side of National at Federal Ave. Free coffee..
Free Parking: In the rear lot.